The National Bank student awards were held on Friday, June 10, 2016 in the Margaret Page Lecture Theater. The awards are aimed at recognizing students from the constituent colleges of the University of Malawi who have performed well academically. In attendance at this year’s ceremony as special guests were the Chief Executive Officer of National Bank of Malawi, George Partridge, the Vice Principal of Kamuzu College of Nursing, and UNIMA’s Vice Chancellor, Dr John Saka. 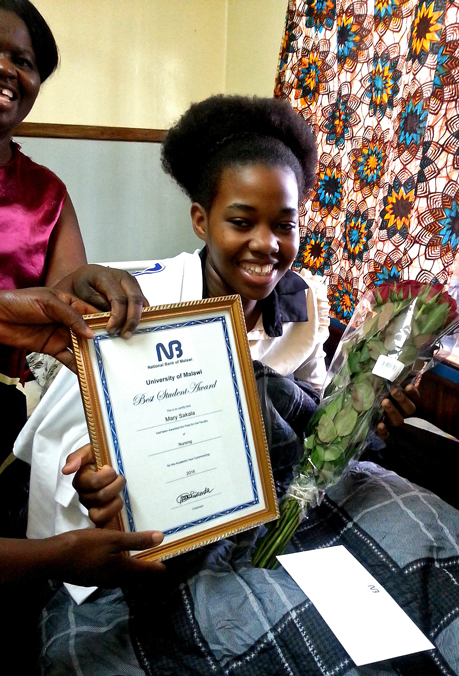 Among the students who received awards this year were Ethel Chirambo and Mary Sakala who are both students at KCN pursuing their Bachelor’s degree in Nursing and Midwifery. Mary Sakala is currently in her third year and is also one of the students who were nominated for an exchange programme and she will leaving for Canada in due course. After graduation, Mary would like to work as a bedside nurse/midwife to gain experience before pursuing a Master’s degree in Public Health majoring in nutrition.She is aspiring to be one of the PhD nurses and her area of interest is nurse-patient relationships. She also wants to write a book on the ‘Power of nurses in the healing process of patients’. When asked what she would like to be remembered for at KCN, Mary said: “As a hard working, focused, determined, ambitious student who tries to provide quality care to patients and clients.” Mary received her award in absentia, she was in hospital on the day of the awards ceremony and KCN lecturers visited her and presented her with her award.